Mark Brandi burst onto the crime scene with Wimmera, a debut that won the British Crime Writer’s Association’s Golden Dagger for best first novel when it was still an unpublished manuscript. That book pulled very few punches when looking at how children were groomed and sexually abused, how their communities turned a blind eye and the long term consequences of that behaviour. Set in rural Victoria it might have indicated that Brandi was aiming to settle in to the growing Australian rural noir landscape. His follow-up, The Rip, shows that Brandi wants to be anything but comfortably settled. Something has happened and someone is being questioned by the police in a short cold open to The Rip. This sets an ominous tone before the first person narration begins. The narrator, not named until close to the end of the book, is homeless. She lives on the streets of Melbourne with her friend Anton and her pit bull Sunny, making enough money to scrape by and to buy the drugs she needs to maintain her habit. The three live under a grandstand in a city park in central Melbourne. Anton is constantly trying to come up with money making schemes to stop her falling back on prostitution. Then they meet Steve, someone from Anton’s past, who invites them to move into his flat and provides her with the drugs that she craves. And then the slide begins, as she describes it: the pull of the rip into deeper, darker waters. But while she can sense the danger, she cannot resist the need to feed her habit. In The Rip, the streets of inner Melbourne come to life. Not the restaurants and cafes and offices but the Centrelink Office, Salvos and the parks which are a home to the homeless. Through the main characters and those that they meet is interleaved tragic backstories of abandonment, foster homes, abuse and neglect. But somehow the narrator manages to keep a positive attitude, an optimistic view of the world that belies her situation and despite a creeping sense of dread and menace. Brandi once again has delivered gritty crime fiction with a social conscience, shining a light on a world that many readers would otherwise look away from. He takes forward a number of themes from Wimmera with a focus more on the long term effects of child abuse, neglect and detention. 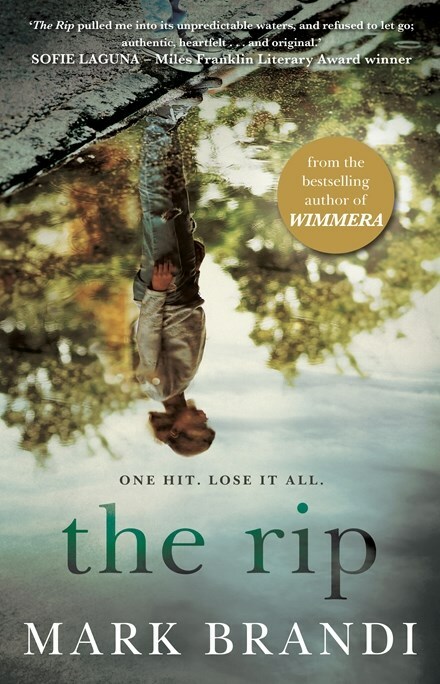 The Rip is another assured, powerful piece of crime fiction.